GDC 2014 is fast approaching, and the guys over at The ReAnimators Podcast have interviews with all the speakers at this year’s Animation Bootcamp. Here’s the write-up of my GDC 2013 talk, (available on the GDC Vault behind a paywall), on the approach we took in refreshing the animation of the Assassin’s Creed series for its third major outing. UPDATE: The full video presentation is now available for free on the GDC Vault here. Assassin’s Creed III was my first game after arriving at Ubisoft Montreal back in early 2010. I can’t tell you how fortunate someone like myself was to work on Assassin’s Creed as to me it has been a standard-bearer for animation since it’s initial release in 2007. Many people at the time told me that AC was the studio leader in animation, so with the position of animation director came a lot of responsibility – the pressure from above to not screw up what came before was immense. 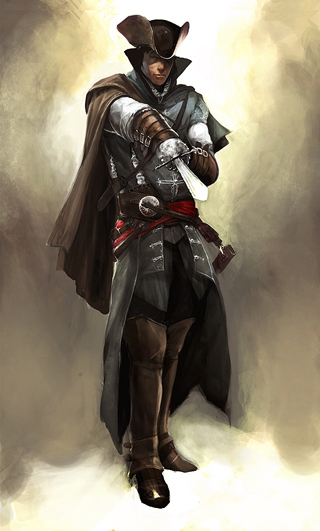 An early Connor sketch, containing elements of what would later become Haytham. The initial mandate we received was to completely revitalise the animation of the Assassin that had remained largely unchanged since the original – to essentially re-establish Assassin’s Creed as an animation leader in the industry. However, not wanting to simply rehash what was done before, I gave myself and the team the task of aiming to not only make it look better, but also “feel” better. Assassin’s Creed is traditionally slow and fluid, which goes some way towards the trademark “weight” of the player character. I wanted to make him more responsive, without sacrificing any of the animation quality. This task was made even more difficult because, as we end out this generation of consoles, no new hardware was available to push an engine already strained to its limits. We didn’t have a new load of memory from where we could simply add animations. Thankfully, during my research early in the project I happened upon the “Brand Bible” which stated that animation quality is the third most important feature of the AC brand, (after the hooded silhouette and the fantasy of being an Assassin). This gave me a lot of leverage to push ideas through and get the support needed to perform this task. Conception – Starting the project. The Assassin – Who is he? Navigation – Improvements to ground, parkour and climb. Fight – Reworking the brutal fighting style. Crowdlife – The living world plus wildlife. Cinematics – Full performance capture. Assassination – The name of the game.